Explore hidden gems such as Battlefield Vegas and Dig This. 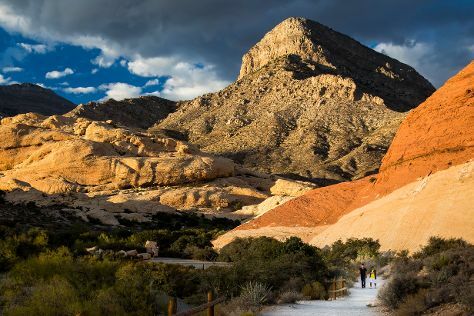 You'll find plenty of places to visit near Las Vegas: Ibex Dunes (in Baker), China Ranch Date Farm (in Tecopa) and Little Finland (in Mesquite). Spend the 21st (Thu) riding across the waves with a waterskiing or jet-skiing adventure. Spend the 9th (Sat) exploring the stark beauty of Escape Adventures and Las Vegas Cyclery. There's still lots to do: explore the stunning scenery at Red Rock Canyon National Conservation Area, try to win big at Bellagio Hotel and Casino, get a taste of the local shopping with The Strip, and wander the streets of The LINQ Promenade. To find other places to visit, reviews, maps, and other tourist information, you can read our Las Vegas tour itinerary builder site . If you are flying in from Brazil, the closest major airports are McCarran International Airport and Laughlin Bullhead International Airport. March in Las Vegas sees daily highs of 27°C and lows of 13°C at night. Finish your sightseeing early on the 24th (Sun) so you can travel back home.